With a market-driven menu inspired by coastal mediterranean cuisine, regional wines and craft cocktails, Margot offers an elegant dining experience. Umbrella was tasked with creating branding for Margot that resonates with its unique offerings. 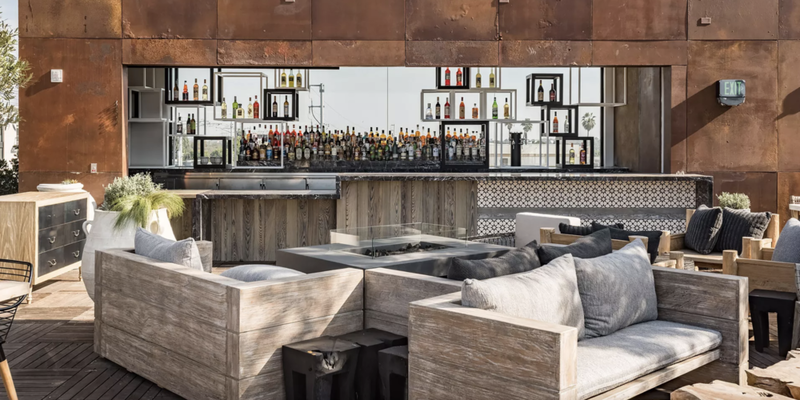 Situated at the stunning rooftop of The Platform in Culver City, Margot’s indoor and outdoor spaces include 360 degree views of the city, greenery, ample natural light and several distinct dining experiences throughout the space. When designing Margot’s branding, Umbrella took into account the restaurant’s design forward, architectural grandeur, tempered by warm approachability. The design had to imply an elevated aesthetic while suggesting greenery and Margot’s close ties with its local suppliers, which its farm-to-table cuisine relies on. Umbrella’s design work includes Margot’s logo, menu, website, uniform, as well as its typefaces and corresponding style guide. In addition, Umbrella has created Margot’s photographic content for its digital and print applications.